Ocean City has worked hard to ensure that parking is accessible for our visitors. Parking is available in city lots, private lots and on certain public streets unless otherwise noted. For general parking questions, please call (410) 524-0391. Paid parking is in effect from April 1 through October 31. Inlet Lot Parking Rate: $3 per hour (except July 4). You will need to know your complete license plate including letters. The Town of Ocean City has a “NO REFUNDS POLICY FOR PARKING”. BE SURE YOUR TIME IS CORRECT BEFORE PRESSING “YES” and committing. You are solely responsible for entering your time in the machine and verifying that the amount of time is correct and the amount you wish to pay is correct. If you are uncertain, cancel the transaction and start over. A 30-minute courtesy period is given to all vehicles in the Inlet Lot, including handicapped. Handicapped vehicles (must have handicapped plates or a visible placard) may park for up to one hour at no charge on-street or in municipal lots only, not including Inlet Lot. Please do not park in front of any red painted curbs, or in front of any public or private driveways. It is also important to note that when parking next to the curb, please park with the flow of traffic with your vehicles wheels within 12 inches of the curb. …what this means is that when you park, you no longer get a “receipt” that you have to put in your windshield. Instead, you enter your License plate at a nearby kiosk & the system will recognize your “paid time” based on your vehicle. (Note: You must know your license plate number) This will be camera enforced at the Inlet Parking Lot and enforced by Public Safety Aids on the Streets and Municipal Lots. ParkMobile App, Credit Card or Quarters Accepted. Enjoy the beach & boardwalk! Pay for parking right from your phone! Download the FREE app on your Apple or Android device. Call the toll free # on ParkMobile signs and stickers throughout town. Once registered, use the benefits of this service as you pay throughout the downtown area. Using the app, simply enter the zone number listed on the sign to start a parking session. Don't have a smart phone? No problem! You can also pay for parking using a credit card or cash. Boardwalk or beach bound? Parking is easy and convenient in this centrally located lot at the southern most point of Ocean City. The lot provides 1,200 parking spaces including 35 handicap parking spaces and quick access to our bustling boardwalk and beautiful beach. Complete with a passenger load and unload zone, this lot is open 24-hours, year round, with the exception of some special events. Paid Parking season is in operation from April 1st to October 31st. Parking in the Inlet Lot is $3.00 per hour. Inlet Parking Lot visitors can pay for the desired amount of time when you park or before you leave your parking space by paying for the amount of time you stayed. Remember, you’re first 30 minutes are free, including handicapped! You do not need to display a receipt on your dash. Instead, you enter your license plate at a nearby pay station & the system will recognize your “paid time” based on your vehicle. (Note: You will need to know your complete license plate including letters.) You may also pay with the ParkMobile App. A violation of Inlet Lot Parking will result in a mailed bill of time spent in the lot at $3 per hour, plus a $25 administrative fee. This fee will escalate to $50 if not paid within 30 days. Patrons must pay for expired time prior to leaving the Inlet Lot to avoid being billed for additional administrative costs. Need help? Parking lot ambassadors are available at the booth located in the center of the inlet parking lot (Row E). $2.00 per hour with one hour free for handicapped parking. Handicapped vehicles (must have handicapped plates or a visible placard) may park for up to one hour at no charge on-street or in municipal lots only, not inlcuding Inlet Lot. A violation of Street Parking & other Municipal Lot parking will result in a physical parking ticket ($50 fine) which can be voided if payment is made at a pay station for expired time within one hour of receiving the ticket. Weekly & Daily parking paid at 100th Street does NOT apply to parking at the Inlet, on-street parking, or any other municipal lot. You will also see additional street side Parkeon® pay station parking on selected streets, ocean side and bayside in the areas between S. Division and 10th Street, and again at 99th St. While you're in town, why not give your car a vacation, too? The West Ocean City Park & Ride offers FREE ample parking at 12848 Ocean Gateway. Not only is the parking free, but the lot offers spectacular scenic views of the bay, surrounding wetlands, the Ocean City skyline and of course, the gorgeous sunsets Ocean City is known for. Visit the octagon gazebos for amazing bird-watching. And be sure to read the interpretive signs and checkout the railroad bridge and brick walkways before catching the shuttle into town. 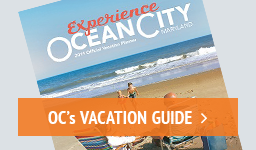 Shuttle service from the West Ocean City Park & Ride is $3 Ride-All-Day. Please observe posted rules and regulations at the Park & Ride. Restrictions apply. It shall be unlawful to park any commercial vehicle unless performing services for or on behalf of the Mayor and City Council. It shall be unlawful to utilize any vehicle for sleeping quarters. No Overnight Parking Allowed – Vehicles and trailers will be towed if parked between 3:00 a.m. and 6:00 a.m.
Information on Towed Vehicles Contact 410-723-6608. Ocean City is pleased to offer charging stations. For information on those locations please click here. RVs and other oversized vehicles may not park in any municipal lot, public street or alley between May 1st and October 31st of each year by Town Ordinance. An oversized vehicle is defined as 21 feet, 2 inches or more in length, and 6 feet, 8 inches in width, needing more than one parking space. For more information, call the Ocean City Police Department at 410-723-6610. Updated ordinance highlights effective May 1, 2016 click here. No trailer or oversized vehicle parking on Baltimore Avenue at anytime. No trailer or oversized vehicle parking on any street or public lot without a permit between May 1st and October 31st, except the 100th Street municipal Lot and the West Ocean City Park & Ride. Permits are available to registered participants of certain special events from event promoters including Cruisin’ Ocean City, OC Bikefest and Endless Summer Cruisin’ for a fee of $50.00. Other permits will be issued on a case by case basis by the Town of Ocean City’s Director of Special Events. The new ordinance applies to trailers that are both attached and detached from vehicles. Any oversized vehicle is any vehicle that is either over 21 feet, 2 inches in length and/or over 6 feet, 8 inches in width. The fine for trailer and oversized vehicle violations is $250.00. Scofflaws (3 or more outstanding tickets or $100.00 or more in outstanding fines) may be booted or towed. Bringing a boat? Keep in mind that a person may not park a boat trailer on public streets, alleys, or public parking lots from May 1st through October 1st. A boat trailer may not be ticketed or towed unless a warning notice has been posted on the boat trailer at least 8 hours prior to ticketing or towing.